ABU DHABI, Jan 16 2018 - A new policy brief co-authored by the International Renewable Energy Agency (IRENA) and the World Resources Institute (WRI) finds that increasing the share of renewables, in particular solar photovoltaic (PV) and wind, in India’s power mix, and implementing changes in cooling technologies mandated for thermal power plants would not only lower carbon emissions intensity, but also substantially reduce water withdrawal and consumption intensity of power generation. 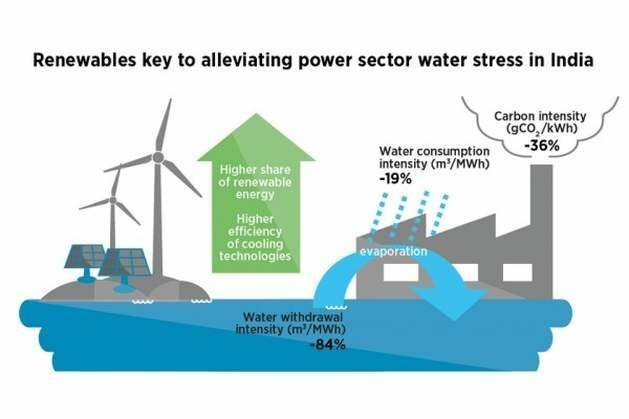 "India has emerged as a global leader in renewable energy achieving record-level growth in deployment, rapid cost reductions and many socio-economic benefits of the energy transformation,"
The brief, Water Use in India’s Power Generation – Impact of Renewables and Improved Cooling Technologies to 2030, finds that depending on the future energy pathways (IRENA’s REmap 2030 and the Central Electricity Authority of India), a power sector (excluding hydroelectricity) transformation driven by solar PV and wind, coupled with improved cooling technologies in thermal and other renewable power plants, could yield as much as an 84 per cent decrease in water withdrawal intensity by 2030, lower annual water consumption intensity by 25 per cent and reduce carbon emissions intensity by 43%, compared to 2014 levels. It builds off of the findings of Parched Power: Water Demands, Risks, and Opportunities for India’s Power Sector, also launched today by WRI. More than four-fifths of India’s electricity is generated from coal, gas and nuclear power plants which rely significantly on freshwater for cooling purposes. Moreover, the power sector’s share in national water consumption is projected to grow from 1.4 to nine per cent between 2025 and 2050, placing further stress on water resources. Renewable energy, with the added potential to reduce both water demand and carbon emissions, must hence be at the core of India’s energy future. The joint brief was launched at the World Future Energy Summit 2018 in Abu Dhabi.